At Kerley Signs, we manufacture our post & panel and plywood signs from the best MDO. They are very durable and last for many years. Design possibilities are endless for these types of signs, as they can be cut into any shape and finished in any color or colors of the customers choosing. 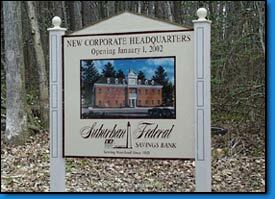 We can also produce full color photographic images for placement on these signs. Being how there is a wide variety regarding the types of signs which are available for your business, it is important to consider all options. Perhaps one of the most versatile sign forms can be found when dealing with panel plywood commercial signs. Here at Kerley signs we are able to provide the Maryland, Virginia, and Washington DC areas with the highest quality of manufactured MDO. These panel plywood signs are extremely versatile with regards to the wide range in which the plywood can be shaped, sized, and colored. It can be seen as possibly one of the best investments for a company to make simply due to the fact that it allows you, the customer, to depict exactly what you want your sign to convey. Also, here at Kerley Signs we have the ability to produce full color photographic images for placement on these signs, allowing the best of both worlds. So contact us today and let us create the perfect sign/image to help stimulate your business.